There is no word I can think of that more aptly describes Book of Life than “charming”. As in, “It was so freaking charming. I am so freaking charmed.” I say this because these are actual quotes of my roommate and I leaving the theater, still stuck in a world of magic and wonder and all you can eat churros, thinking about how happy we were to see that movie, even if it was in an empty theater late on a rainy Monday night. I’ve been excited for this project for a while, actually, ever since I heard that Guillermo del Toro was producing an animated film set in his home country of Mexico and devoted to telling a story from traditional Mexican folklore. Those are words that I enjoy hearing, so I was pretty pumped. Then when I heard who was in the cast (Zoe Saldana, Diego Luna, Ron Perlman, Danny Trejo, Cheech Marin, Anjelah Johnson-Reyes, Channing Tatum), I got even more excited and confused. What the crack could this movie be? Was it possible that this was the holy grail of children’s animated flicks? Were we really going to get a movie about a non-white culture, with entirely non-white characters, that was produced faithfully and lovingly by a cast and crew of predominantly non-white people? As it turns out, yes. Yes that is exactly what happened. I am so so happy right now. Now I’ll be up front and say that I know next to nothing about traditional Mexican culture or folklore. Seriously, I know extremely little. But that neither hindered my enjoyment of this film, nor did it make it seem like this movie wasn’t for me. Rather the opposite, actually. In a very real sense, this movie feels like an attempt to explain and celebrate Mexican folklore in a way that non-Mexicans can understand. The story is a complex but delightful one. On the Day of the Dead, the two rulers of the Realms of the Dead come to earth and watch over the mortals as they celebrate their ancestors. One of the rulers, La Muerte (Kate del Castillo), rules over the Realm of the Remembered. She’s warm and kind and loves people because she believes they are inherently good. In her realm live all of the dead who are still remembered by their families and loved ones. Xibalba challenges La Muerte to another wager. If he wins, they’ll switch places. And if she wins, he’ll forever stop interfering with the living. Which, since it’s the only fun he ever gets, is something he’s not prepared to do. The wager is this: Maria, the town sweetheart in San Angel, has two friends. Her friends, Manolo and Joaquin, are both clearly in love with her. So each of the rulers picks a side and chooses their champion. The bet will be completed when Maria chooses which of the boys she will marry. Xibalba chooses Joaquin, son of the town’s last hero and a strapping young lad who loves fighting and bravery. He gives him a special medal (the medal of everlasting life) to give him a heads up. After all, every girl falls in love with a big strong man, right? La Muerte, though, chooses Manolo, the sweet, sensitive guitar-playing boy whose family wants him to grow up to be a bullfighter. She bestows a blessing too, but her blessing is simply that Manolo will always stay true to his heart. It’s funny because from this point on you really do know exactly who’s going to win the bet. There’s no question that Maria and Manolo are totally right for each other. And, to a large extent, that’s the point. The fun of the story isn’t whether or not Maria will choose Manolo, it’s how all of this will go down. So we fast forward ten years or so, until Maria (Zoe Saldana) has returned from being educated in Spain, and Manolo (Diego Luna) and Joaquin (Channing Tatum) are all grown up. 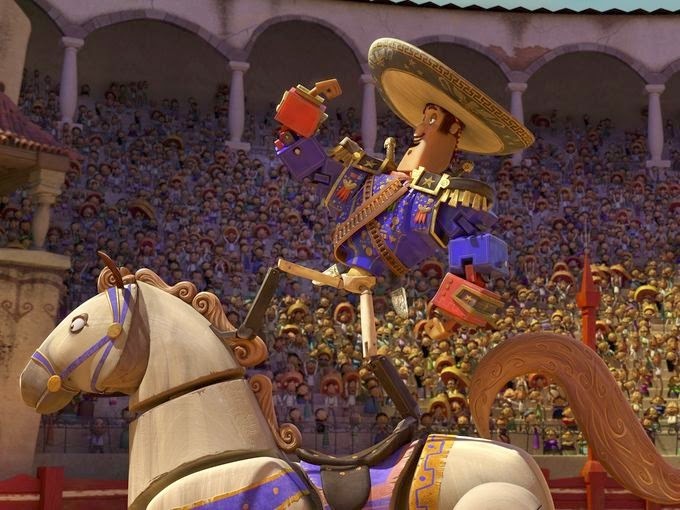 Joaquin has become renowned throughout Mexico as a great hero who fights the bandits and is the only one who can protect them from the evil bandit Chakal, while Manolo is mostly known as a potentially good, but shamefully laid back, bullfighter. Maria’s father, who happens to be the mayor, shoves Maria towards Joaquin, but she prefers Manolo. As Xibalba watches, he realizes that he’s going to lose the bet, and so he decides to cheat. When Manolo and Maria meet at dawn to talk about getting married, Xibalba enchants a snake to bite Maria, seemingly killing her. Manolo is devastated as is the whole town. He falls down and sobs that it should have been him. Of course, Xibalba immediately appears and agrees that it should have been him. So, is Manolo willing to sacrifice himself to be with Maria again? Manolo is, and then two snakes appear and bite him. He dies. And then immediately wakes up in the land of the Dead, the Realm of the Remembered! He figures that Maria must be there too, and he searches all over for her. But before he finds her, he runs into his whole extended (dead) family, including his mother and grandfather and all the Sanchez bullfighters who came before him. 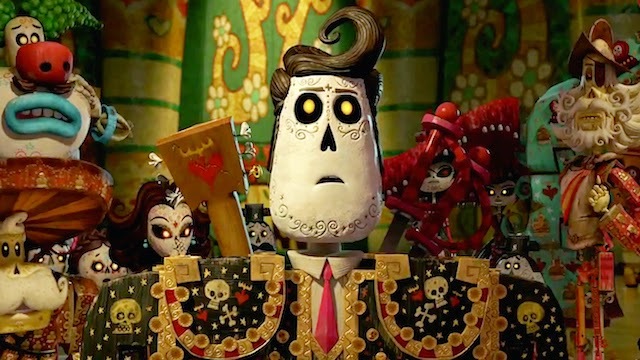 They all agree to take him to La Muerte’s castle so she can help him find Maria. Upon reaching the castle, though, they discover Xibalba has already taken residence. See, Maria isn’t dead. That one snake bite only put her in a trance. Joaquin was able to wake her up pretty quickly. But two snake bites? That’s lethal. And now Maria will marry Joaquin, and Xibalba will win the bet. But Manolo isn’t going to take this lying down. He knows that if La Muerte found out Xibalba cheated, she would annul the bet. So all he has to do is make his way down to the Realm of the Forgotten and tell her. Okay, I’m going to stop recapping here, because you should all just go see the movie for yourselves. But trust me that this is only the beginning, and the whole story takes you on this rollercoaster through all the realms, through true love and sacrifice, and in the end you just can’t stop smiling because it’s so wonderful. Even if this were a generic story, and I weren’t so invested in cultural representation in children’s media, I would still be pretty pumped. Because it’s a freaking well made movie. It’s beautifully written, funny, gorgeous to look at, and all of the characters are interesting and fleshed out. For all that Maria is “the girl” and basically a prize the guys are fighting over, she’s actually a really well realized character. She’s irritated by their rivalry, gets pissed when all anyone talks about is who she will marry, and is effortlessly badass in a way that doesn’t feel like a joke. Joaquin, who would be easy to write off as “the bad guy” simply because he’s the one who doesn’t get the girl in the end, is actually a pretty fun character. He and Manolo genuinely are good friends, and they don’t let their rivalry over Maria get in the way of that. Sure, he’s a braggart and he thinks every battle can be won with fists and he doesn’t have very enlightened views on marriage, but none of that is presented as being bad guy material. He’s just not the right guy for Maria, and to a large extent he knows it. We even get the impression that when all is said and done, he doesn’t want to marry her anyway, because he knows she loves Manolo. And Manolo? Yes, he is the sweet, sensitive romantic archetype, but he’s a very well thought out iteration of that trope. He’s an accomplished musician as well as an accomplished bullfighter, and his great fear is not that he will get hurt or even that Maria will not love him back. It’s that he will disappoint his family (who are famously all bullfighters) by following his heart. Also he’s a bullfighter who refuses to kill the bull and at one point literally sings his way to victory. How can you not love this guy? Granted, there are things about this movie that aren’t perfect. As great as all of the female characters are, it still only barely edges its way over the Bechdel Test. And while Maria is a really compelling and fully realized character, she’s still basically the ball in a game of soccer between Manolo and Joaquin. The third act is okay, but parts of it felt a little perfunctory. Like, of course the MacGuffin is coming into play here. And of course they can only defeat the bad guy together. Not bad tropes by any means, but there were moments when I wished for a touch of the originality that flows through this whole film to hit the third act. Still. Those are incredibly minor complaints, and the overall effect of this movie is one of wonder. The story is charming, the characters are lovely, the art is gorgeous, and the whole message is just so freaking wholesome and heartwarming and true. Guh. I mean, it’s a kids’ movie about how the truest form of love is self-sacrifice. How is this not your favorite thing ever? Purely from a technical standpoint as well, the film is just masterfully done. In order to get around the people like me who know absolutely jack about Mexican folklore, the film built into itself a framing device: this is all a traditional story being told to a group of school kids on a museum field trip. But the framing device actually manages to transcend its origins as a simple excuse for voiceover narration and becomes a compelling storyline of its own when we grow to really care about the kids hearing the story. Because it’s not an accident that they’re hearing it. They’re hearing it because they need to learn how to live a good life. And that’s pretty awesome in and of itself. There’s just so much to love in this film. For me, though, it really feels like the anti-Disney film. In the best possible way, I mean. Because where Frozen used parts of native cultures appropriatively, with no reference to the origin and meaning of those cultural symbols, Book of Life is completely steeped in its culture. It’s not a movie with some Mexican stuff thrown in for the sake of “political correctness” nor is it a film shamelessly ripping off indigenous culture. It’s a film by Mexicans for everyone about Mexican culture. Heck, in the beginning few minutes of the movie the narrator actually says, “Now, as we all know, Mexico is the center of the world.” And she is neither kidding, nor being intentionally ironic. She’s just stating a fact. Mexico is the center of the world. And, yeah. This is a Mexican folktale, so Mexico in this story is the center of the world. That’s a given. It pretty much highlights the difference between cultural appropriation and cultural sharing. Because this is a movie made for a predominantly non-Hispanic audience (hence why they’re always explaining everything), but it’s made with love. As a sort of, “Here’s what we love about our culture. You are free and welcome to love it too.” And I want more of that in the world. That’s a great thing. It’s not about us coming in and taking anyone’s culture, it’s about them deciding to share it. Who doesn’t want more of that? Major props are due to the writer/director, Jorge R. Gutierrez, who reportedly worked for fourteen years to get this to screen. Apparently studio executives were convinced that no one would want to see a “Hispanic story”. Which is total crap. But if this movie doesn’t blow them away at the box office, I’m a little afraid it’ll become an excuse for them to not bankroll the next amazing culturally sensitive film that comes along. Which brings us to my plea for everyone to freaking watch this film. It’s appropriate for all ages, inherently wonderful and full of joy, and just the sort of thing that you want to see on a dreary October day leading up to Halloween. So please go see this movie. Please. You won’t regret it. Cool, I hadn't heard of this. One to look out for (it should hit my local cinema at some point). Yay! It's such a fun movie.